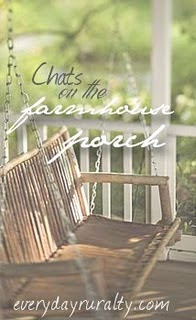 If you're here for Chats on the Farmhouse Porch, the 25 Days of Christmas blogshare or Get Wired Wednesday only, then scroll down. 1. Are you cooking Christmas dinner? How many will be round your table this year? What are we having? I am cooking. For Christmas brunch it will be Bourbon shrimp on Charleston grits. The dinner will be very traditional and resemble Thanksgiving dinner. It's just a few of us so we'll have 11 around the table. 2. What is one must-have Christmas cookie in your house? My dad's homemade oatmeal raisin for Birdie and me and his homemade chocolate chip for everyone else. He's bringing them down on Friday. But I will NOT succumb to temptation. I won't. No way. Really. 3. Santa likes a glass of milk with his cookies. Do you? What kind of milk is on tap at your house-skim? almond? soy? full fat (Gasp!) When I ate cookies I did. We use coconut milk here now. Except for DoodleBug who prefers almond milk. 4. Time magazine recently named their 'Person of the Year' for 2011. This is the person the editors believe had the greatest impact, for better or worse, in the past year. This year they chose 'The Protester'. Your thoughts? Who would you name Person of the Year for 2011?I have no thoughts on this whatsoever. I prefer to think in a more close to home manner. And, this year, I think I would choose Birdie for being so brave and moving out to Texas for grad school with no one but herself and her dog. Or DoodleBug for keeping such an amazing focus and ending her semester with a 3.5 and being so passionate about education. Or Deanie for sticking it out and persevering when the economy hit her job. Or Breezy for continuing to amaze us with her numerous talents and genius. Or Hubs who, no matter what, keeps a happy spirit and loves us all unconditionally every single day of our lives.These are the people of the year for me. They are the ones who have the greatest impact on my life. 5. December 21st is National Flashlight Day... when was the last time you needed a flashlight and did you know right where to find one? I needed one just two nights ago to see what in the heck Tucker was barking at in the backyard. And yes, I knew right where to find one. 6. candy canes...yum or yuck? Depends on the flavor- peppermint? Yuck. Just about any other flavor? Yum! And Carol of the Bells but only when Deanie sings it- she sounds like an angel when she sings. And so very many more! They are all meaningful to me! 1. What is your favorite Christmas tradition? The lovelies like getting their Christmas pjs every year and the opening of the sister gifts. I had tons of them when the lovelies were growing up- now I just appreciate us all being together! 2. Are you ready for Christmas? That would be one great big, ginormous- NO. 3. What would you like to talk about if you were sitting in the living room with Patrice? I would love to hear all about her farm and then chat about how great it is to raise daughters! Is anybody ready? Maybe we're all too busy visiting. Just sayin'...not gonna stop that! I always wondered what it woud be like to have more than one daughter. I have two more in my blended family - and you're right...it's great. They just bring so much life and creativity to everything. Stephanie- I think you're right about the busy! And I know you're right about the daughters! The Christmas pj's. I was reminded by my daughter that she expected them under the tree this year. Guess the pair of pajama pants I bought weren't good enough so I had to order the full set of pjs just so she won't be disappointed. Welcome to the club of "not-readies". I can't believe Christmas is Sunday. This season has come about way too fast this year. I believe our mild(er) weather has us fooled! Merry Christmas!!! I love reading about how happy your family makes you. It's very uplifting coming from a family that is not close at all. Keep 'em coming! Great traditions too! Hugs. Cookie- I think you're right about the milder weather. It just doesn't seem at all like Christmas! Barb- Thank you so much! They do bring tons of joy into my life! I can't imagine not being close. You'll just have to come down here and be my sister and aunt to the lovelies! We ticked two large remaining gift purchases off the list yesterday so I'm breathing a little bit easier. I have a better perspective this year. My niece is so ill and we are looking at things with fresh eyes. I think spending time with the lovelies is way more important than getting everything done. Life is precious and people are what matter so enjoy your family. Merry Christmas! Joyce- You are absolutely right! And I have been enjoying them. What doesn't get done, just doesn't get done! Merry Christmas! Debby- It's plenty all right. We're just used to more! LOL Merry Christmas! Gail- I have got to get over and catch up with you! Thanks! And Merry Christmas to you and yours!